Weight Training: “Were You Born For This”? You are here: Home / change / Weight Training: “Were You Born For This”? Was I born for this? Not necessarily. While at the gym today I noticed a caption on the TV screen for what looked like a golf tournament advertisement that said “They were born for this”. I was listening to music on my MP3 player and not actually watching TV so I don’t completely know what the advertisement was about. I don’t watch TV at home so I still don’t really know what it was about. It looked like it was about pro golf players. I did an internet search and the hits confirmed it was about this years PGA tour. That is all I know, I didn’t search any further. Sometimes it feels like yes everything in my life seems to have added up to this point. It feels like what I am doing is my purpose and that it makes an impact on others. Yet when I think about my family, genetics, relatives, or even my identical twin, none of them have done what I have done regarding fitness (and yet I am also nothing special myself). It reminds me of a book I read once called “Outliers” by Malcolm Gladwell. The first two chapters of this book resonate with me on my experience. The first chapter was about opportunity and coaching; I definitely missed the boat on that one for the first part of my life. The second chapter “The 10,000-hour rule” explains why I seem to be good at knowing how to design my own diet and just do the productive workouts every day. I’ve been doing both consistently for over 30 years. I Just didn’t have good coaches or good tools until a few years ago. I now have John Barban, Brad Pilon, the Venus program, and Eat Stop Eat which all gave me the coaching and tools I needed to finally succeed in my fitness goals. And then the skills I have developed during my 25 year career at Hewlett Packard seem to have set me up for doing various jobs recently for the Venus Factor. I could not have planned it but it seems everything fell into place. It reminds me of the Seneca quote that goes something like “Luck is when preparation and opportunity meet”. Sometimes you don’t know what you are preparing for but your passion leads you somewhere. Especially if you work hard at what you love and simply make the best of the situation at hand, even if it is not yet the work you are most passionate about. “Were you born for this?” does not really apply to weight training. Back to the gym: It made me realize that the question “Were you born for this?” does not really apply to weight training. We were all born for it and we can all use it to fit our own lifestyle. It is especially necessary for women because lifting weights just 3 times a week on a consistent basis will ward off osteoporosis. When I was 51 I got a DXA scan that showed my bone density was that of an athletic 30 year old woman. That is a direct result of weight lifting. Women can do the minimum (3 days a week) or take it to higher level conditioning and workout nearly every day. That is the beauty of the Venus Factor program. It is not a one size fits all program. It is a program that women at all levels can participate in; as a beginner, as an advanced athlete, as someone who enjoys working out in the privacy of their own home, as someone who likes a public gym, as a stay at home mom, as a traveling executive, or from any walk of life. The other day I was sitting in a local coffee shop and a guy walked in that recognized. It took me a few moments to remember how I knew him. Then it hit me, he was a subject in one of the exercise experiments I did when I was in graduate school. Back when I was doing research in exercise and nutrition I was running an exercise study where I had to make people do a pretty intense workout for 90 minutes at about 70% VO2 max. That might sound a little technical so let me explain what it means. VO2 max is the maximum amount of oxygen your body and muscles can consume and use during exercise. Most people can only sustain their true max for a few moments until they have to back off or stop completely. The best athletes in the world can stay there a bit longer, but it’s still very short lived. The point is nobody actually workouts out at VO2 max; this is just a way to measure how conditioned you are. It also has a genetic component. In other words some people just have a higher VO2 max even if they don’t work at it. So in our study we set the intensity level of the workout to 70% VO2max. 70% VO2 is also known as ‘anaerobic threshold’ which is the intensity of cardio (running, cycling etc.) that feels like it’s almost becoming a sprint but not quite a job. In short, it’s right at the edge of what you can handle for long duration. Back to the coffee shop: The guy who walked in had the highest VO2 max of any of our subjects and was in the best condition of anybody we studied. He was about 6’4 225lbs, big, lean, muscular, and well-conditioned. He kind of reminded me of the Winklevoss twins from the movie ‘the social network’. Now he looks like he is about 70lbs overweight, and I’ll bet he doesn’t have the endurance or muscular conditioning he did when he was younger. If you asked me to bet on who I would guess would be in shape 15 years after that study, this is the guy I would have bet on. He had it all. The point of this story is to explain to you that even the most genetically gifted people still have to work out regularly and pay some attention to their diet in order to maintain a great looking physique and top conditioning. Nobody is going to lift the weights for you. Consistency from day to day, month to month and year to year is the key to being an Every Day Venus for life. For me it was kind of the opposite of John’s story at the coffee shop. People looked at me in the past and didn’t see any potential. My husband Randy said he saw something special in me a long time ago. He called me his “diamond in the rough”. It’s nice to have someone who believes in you. No one saw potential in me except my husband Randy who believed in me. The slow weight creep started for me in my mid 30’s and continued into my late 40’s where at 5’1″ I peaked out at over 171 pounds. I did not achieve my fitness goal until I was 50. 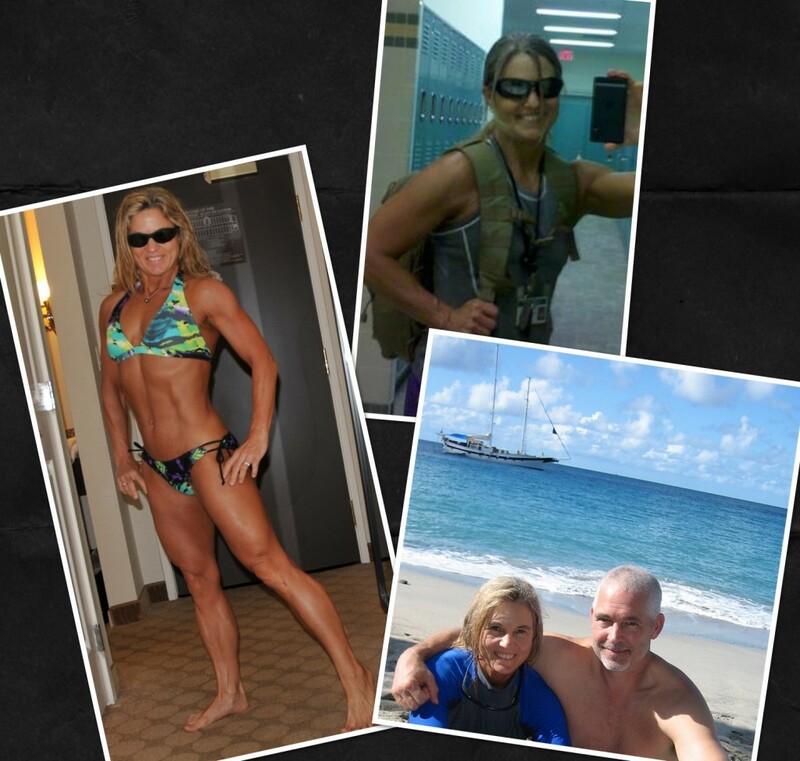 The Venus program took me beyond even my wildest dreams with fitness and changed my life completely. I spent the first half of my life working hard but I was barely average. My genetics did not look like anything special. I am still enjoying the Venus lifestyle two years after achieving my Venus goals. In the Caribbean two years ago, last summer in Las Vegas (green bikini), and last week in the locker room. In fact you could even say that most people are not genetically perfectly proportioned and that we all have some sort of genetic imbalance or asymetry to our predetermined muscle size that we need to work on. The good news is that you are not at the mercy of your genetic shape if you don’t want to be. You can always train yourself toward better overall proportions. The concept of building a proportioned physique should be your goal if you’re working out to improve the look and shape of your body. Working with your genetic strengths and weaknesses in mind will help you direct your effort towards the most efficient use of your time in the gym and get you to that proportioned physique in the shortest period of time. For a look at what we consider the ideally proportioned physique have a look at some of the contest winners from the recent Adonis Index and Venus Index contests. Speaking of contests: Next Sunday August 11th is the last day of our current contest (VT8). VT9 will start September 1st and end November 24th (just in time to enjoy the holiday season). So remember, anyone can do it who decides and then puts the work in. You don’t have to be “Born for this” like the PGA tour golf pro’s. I look forward to meeting some new Venus girls in the contest interviews.